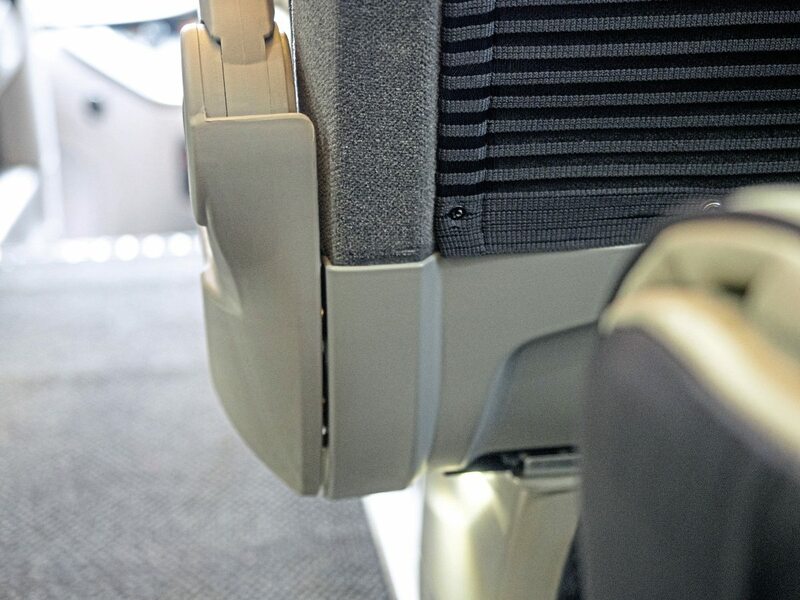 As we head south down the M1 at the start of our road test, I take a sound meter to one of the noisiest seats on many coaches – opposite the centre stairwell. 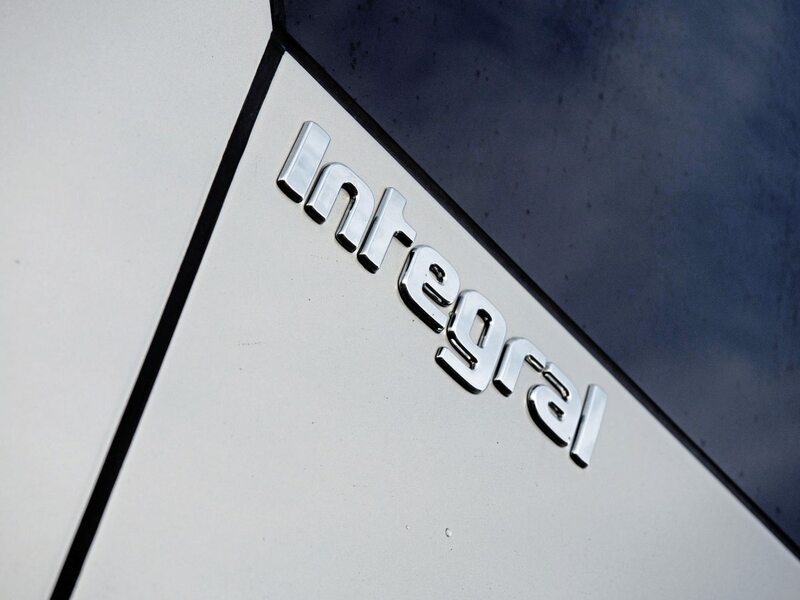 When it comes to premium coaches, Irizar claims to have set the bar very high with the i8, utilising cutting-edge technology to make inroads into territory dominated by German and Belgian products. On paper, it’s already made its mark. 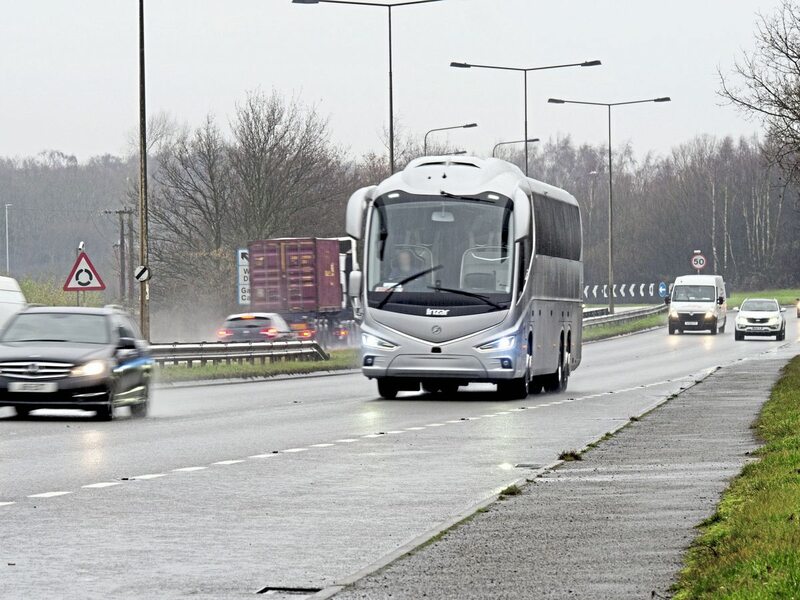 Irizar’s flagship coach, launched with a fanfare in 2015 and few months later in right-hand drive, was honoured with the title International Coach of the Year 2018 at last year’s Busworld. 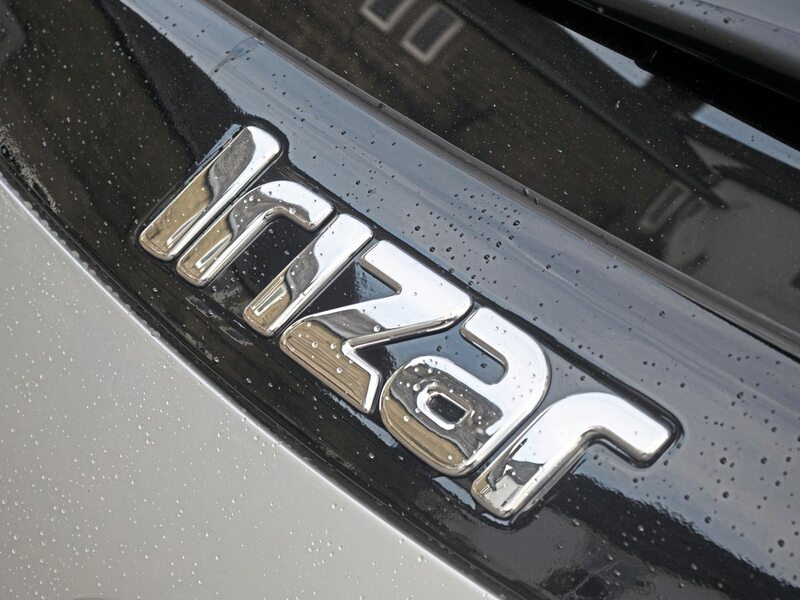 Sales into the UK market have been predictably lower than for Irizar’s ‘standard’ i6 tourer, but the vehicle has found favour with some of the UK’s top operators. 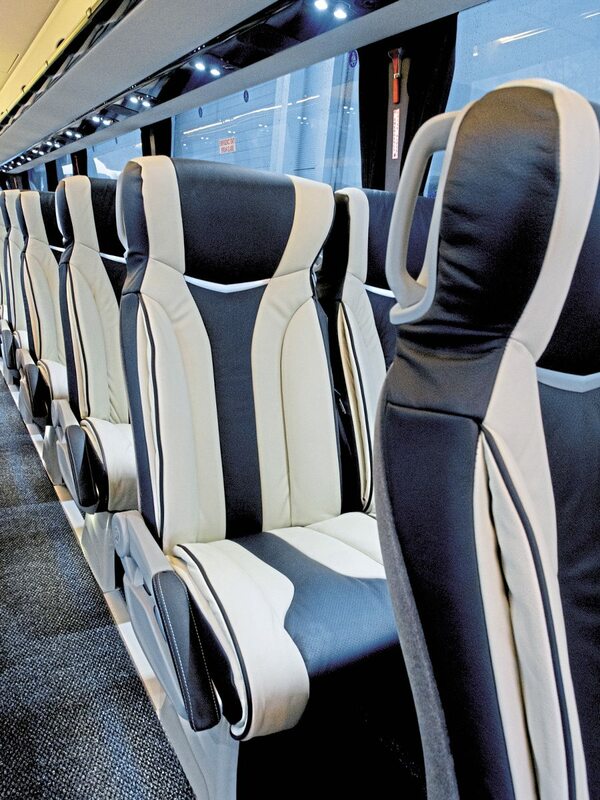 It’s certainly a stunning coach, with strong signs of its lineage. 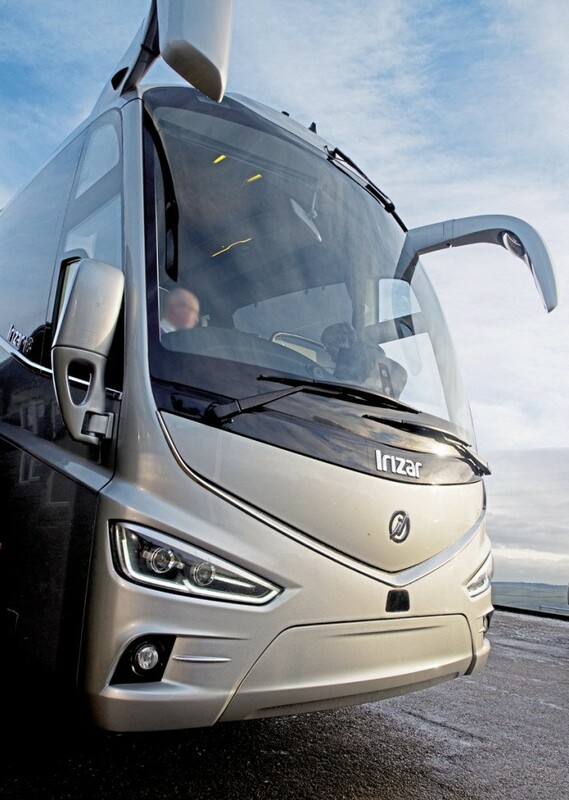 Irizar’s styling cues for the whole family of coaches – the i4 and i6, in all their variants – carry through to the i8, with few opportunities missed to add another curve. 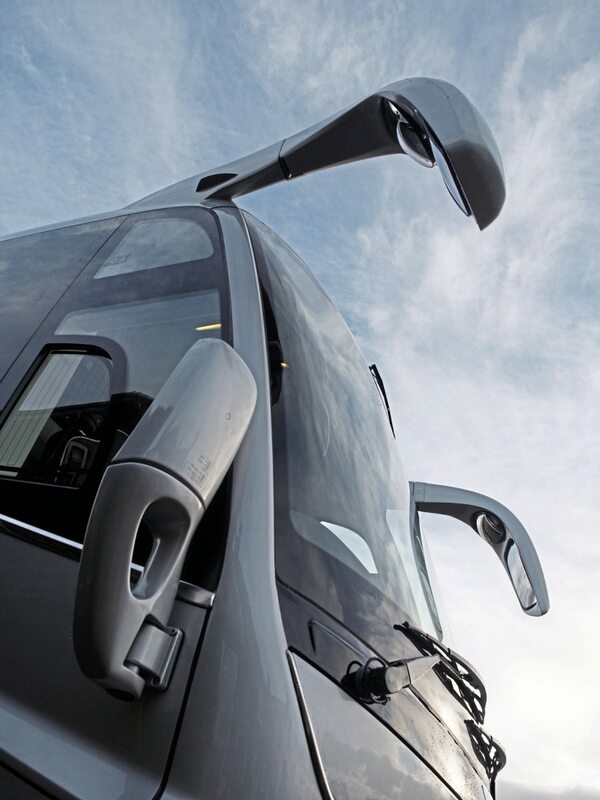 In particular, the central roof bump which began with the PB instantly singles out the i8 as an Irizar product. 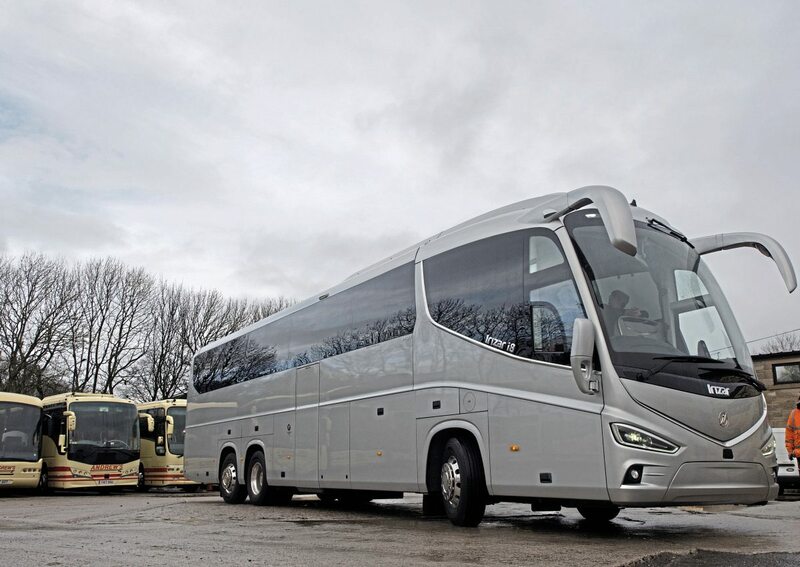 Irizar UK in Worksop imports the DAF-based i8 Integral which has been sold to Clarkes of London, sports team and VIP specialist Ellisons, Lucketts of Fareham, Stewarts of Reading, The Kings Ferry and other operators whose clients demand coaches of the highest calibre and kerbside appeal. We tested the 14.07-metre tri-axle, with DAF PACCAR’s MX13 375, 510hp engine and ZF AS-Tronic gearbox. 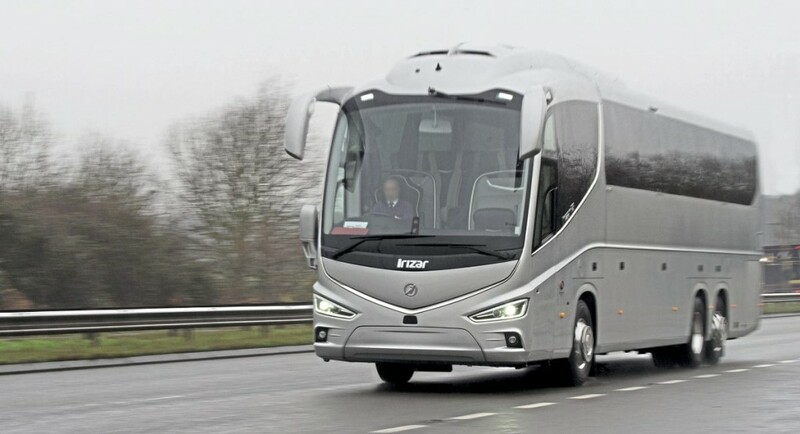 Irizar UK also supplies the i8 in 13.22-metre length, and has the MX13 340, 462hp engine option, and ZF’s Ecolife fully-automatic gearbox for either engine option. All i8s are tri-axles, currently, though a 12.4-metre two-axle may reach the UK in the future. So what’s the i8 Integral like on the road? 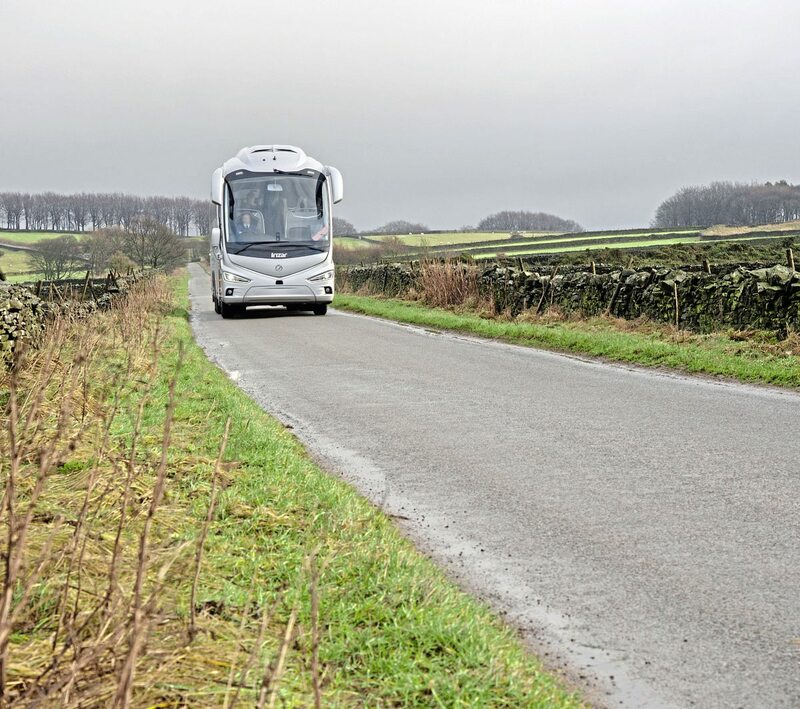 B&CB met up with Irizar UK’s Business Development Director, Julie Hartley, and Area Sales Manager Stuart Smithson at Worksop for a road test in demanding conditions including light snowfall, up into the Peak District National Park. 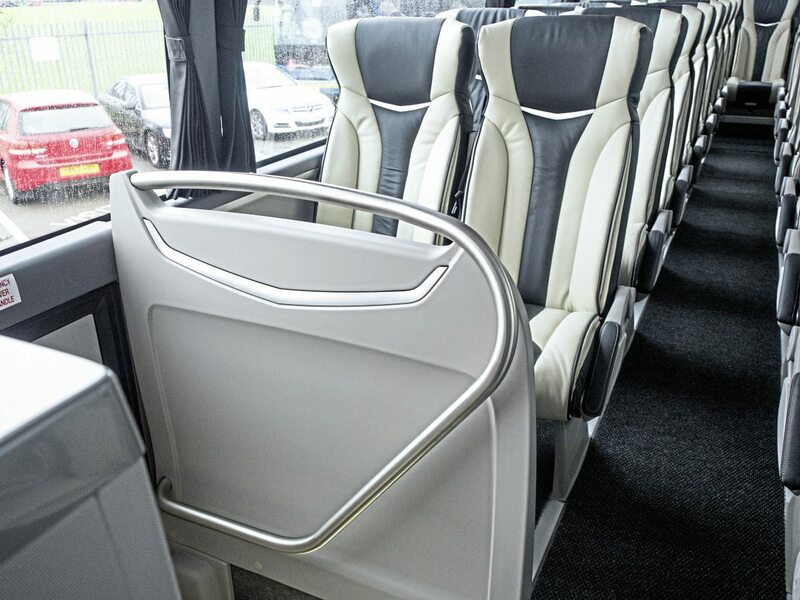 The i8 draws on previous styling cues for modern Irizar vehicles, offering an ‘aerodynamic’ appearance typified by mouldings and panels with wide-radius curves and edges. 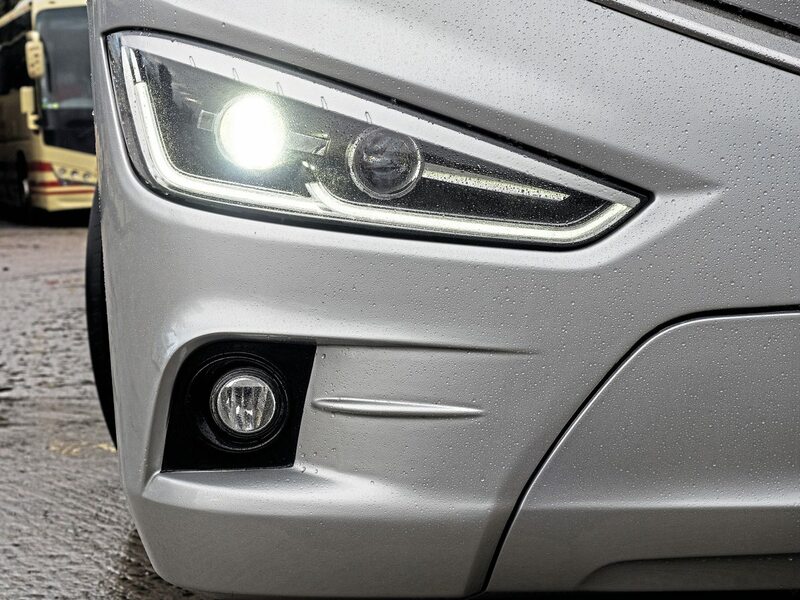 A deep ‘vee’ edge with brightwork trim and central Irizar logo dips into the front valance, which carries the i8’s ‘bright eyes’ LED headlamps, and foglights beneath. A swage line which begins over the headlamps is carried up to the lower waist and continues along the side of the vehicle. The rear of the vehicle is equally distinctive, again with a brightwork vee beneath the rear screen, which has a small roof overhang above it. The lower panel is louvred with three meshed apertures which continue onto the engine cover, the lighting clusters positioned on either side of it. There are two teardrop louvres each side of the rear valance. 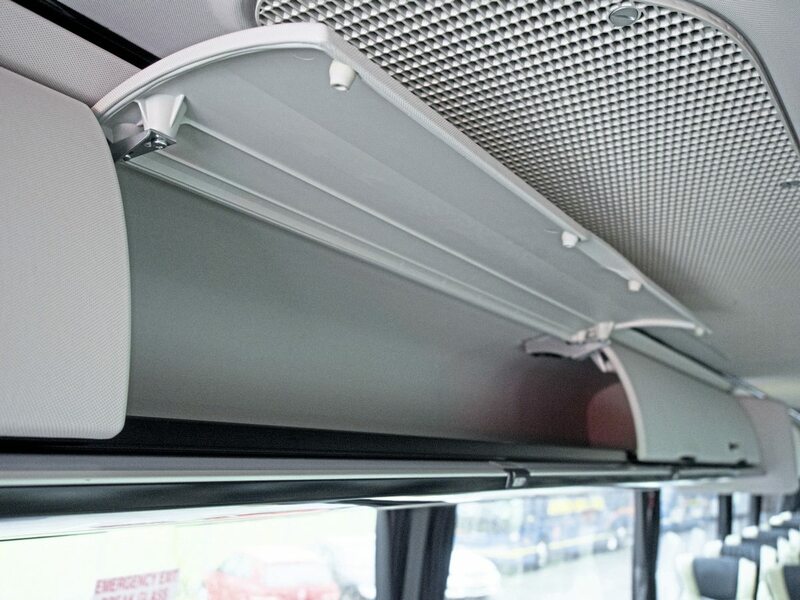 As with most modern coaches, the cooling pack is ventilated by a large louvred panel on the rear nearside. The glasswork is equally distinctive, the single ‘teardrop’ section at the front extending to the B pillar, behind which the saloon glass is in five sections with parallel edges until the last pane, which has a lower edge curved upwards to the roofline. In profile, the central roof bump extends to roughly the midway point of the coach’s length, housing air conditioning condensers. The test vehicle – as with all i8 Integrals – is a tri-axle. The rear wheelarches include hinged panels for inspection. Forward of this are three luggage doors. A further inspection panel at the front is also hinged. 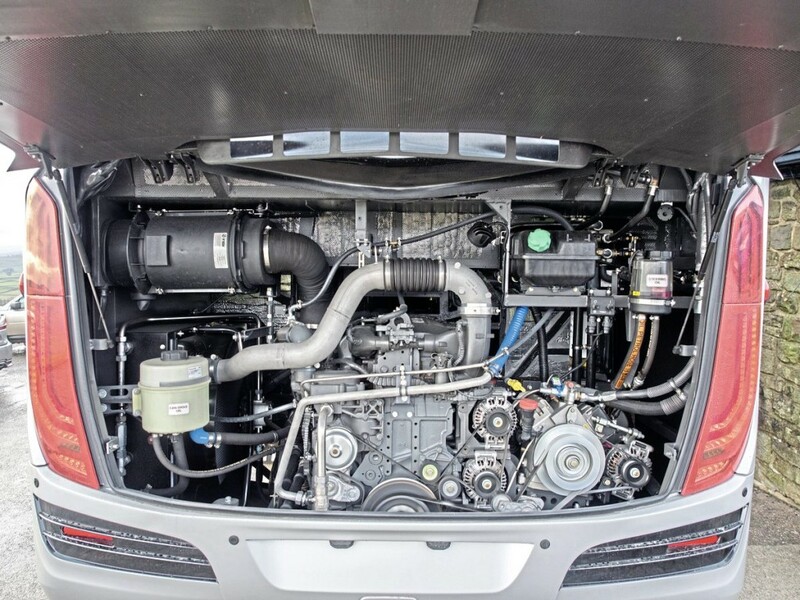 Finally, the engine cover when lifted reveals a very roomy engine bay with built-in lighting which gives good access to most of the engine’s peripheral systems, belts and fluid reservoirs, the latter very clearly marked. Evidence of the time spent styling the interior is immediately evident, with the overhead lockers, flat floor and central ceiling panel suggesting, correctly, that all of the components were designed together for this coach. 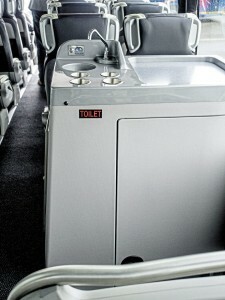 The overhead lockers have sprung doors and handles moulded to them. 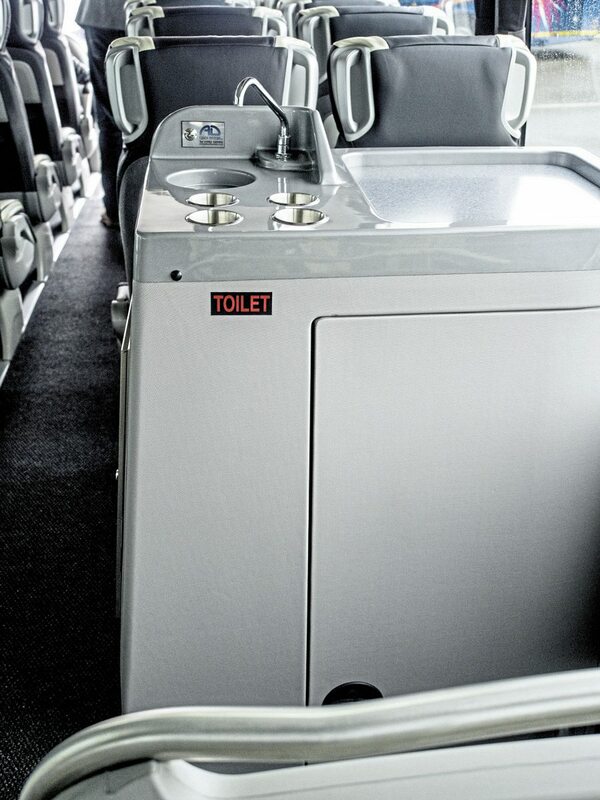 In the forward section, three are lockable for stowing valuables. The panel over the passengers utilises contrasting finishes, the passenger service units being ‘touch button’ gloss black in a gloss black panel running the length of the locker bases. The 57-seat test vehicle had a wood-effect vinyl floor and no textile finishes on the paneling. Curtains run in a concealed rail. 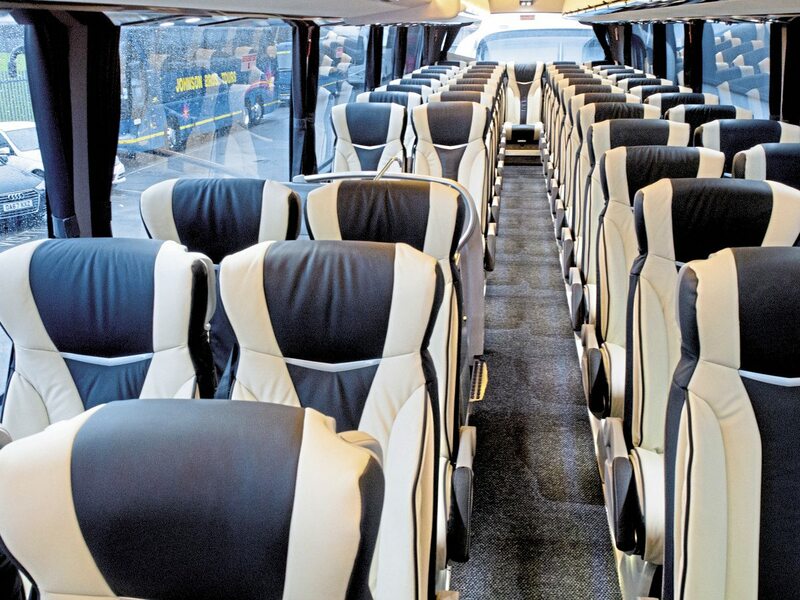 The specially-designed i8 seats, built by Vogel, speak of comfort, with bolstered seat squabs and seatbacks, and a wide headrest which echoes the ‘vee’ styling cues of the exterior. Lift-to-lock armrests are fitted on outer edges and centre, and the aisle seats have a side-slide mechanism which intrudes a further three inches or so into the aisle when in use. 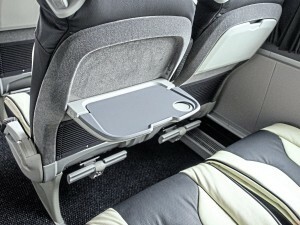 The seat stanchions have concealed fittings into the floor. It is hard to fault the saloon interior, although the dark privacy glass in the test vehicle – on an admittedly dull day – would have made the interior slightly claustrophobic had the vehicle not featured use of light colours. Other double-glazed glass options are available. 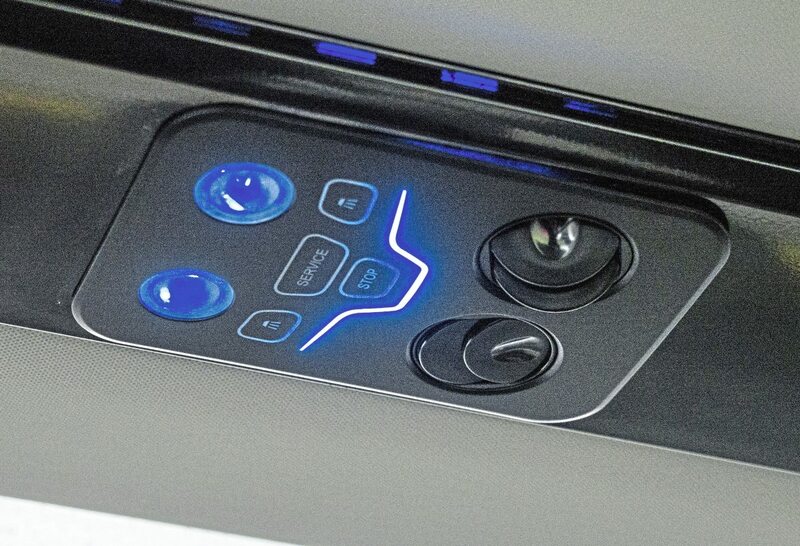 The passenger service units are worthy of note, the edges of the control surfaces illuminated in a neon blue and, in this design, unlikely to suffer passenger damage. The saloon is illuminated with locker-edge strip LEDs, though on the demonstrator, one side was not working; I am told the repair later was a simple one. 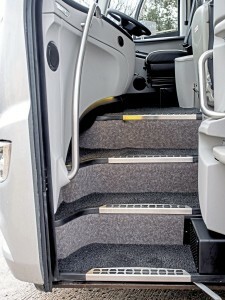 Passenger access is through wide, 900mm stairwells, the steps with brushed stainless nosings at front and centre doors. Both stairwells are amply and automatically illuminated when the door is open. Step heights are modest with stainless grab rails to assist. 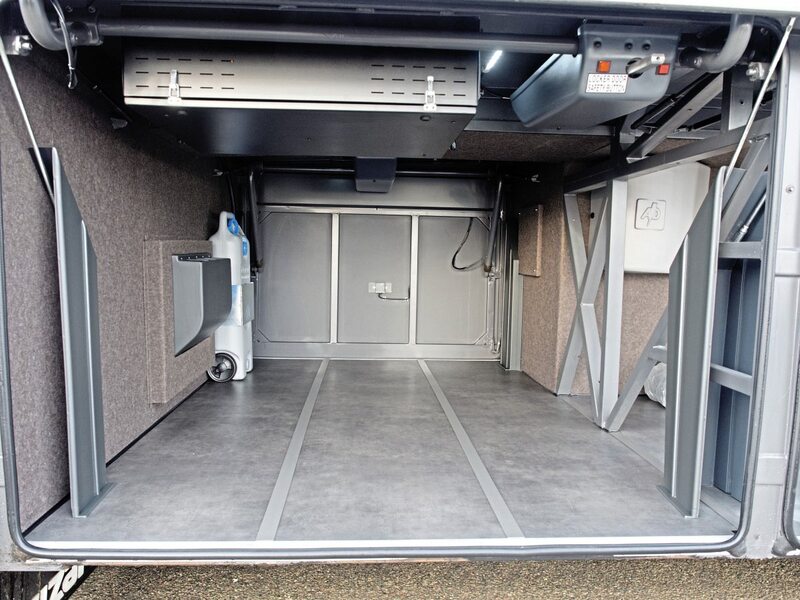 On the test vehicle, the toilet was mounted in the centre stepwell but a floor-mounted toilet at the rear is another option, bringing seating in this 14-metre length down to 54. When i8 was launched at Busworld in Belgium, I spoke to two very experienced drivers about it: ‘The best dashboard we have ever seen,’ they agreed. The dashboard is styled in car-like fashion with curved mouldings, the instruments mounted centrally beneath the steering wheel and switchgear clusters logically arranged. 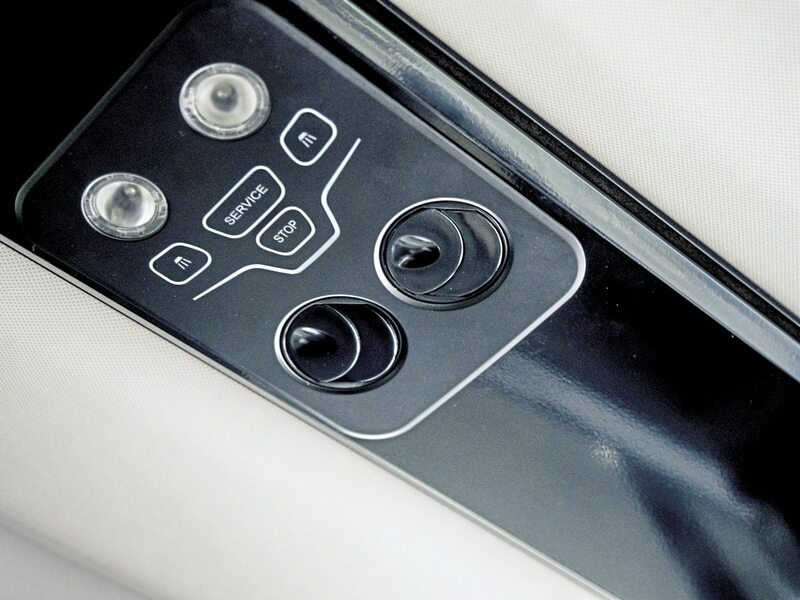 The T spokes of the steering wheel – with attendant phone and speed limiter controls – always obscure some switchgear, but Irizar has ensured those obscured switches are not required when on the move. 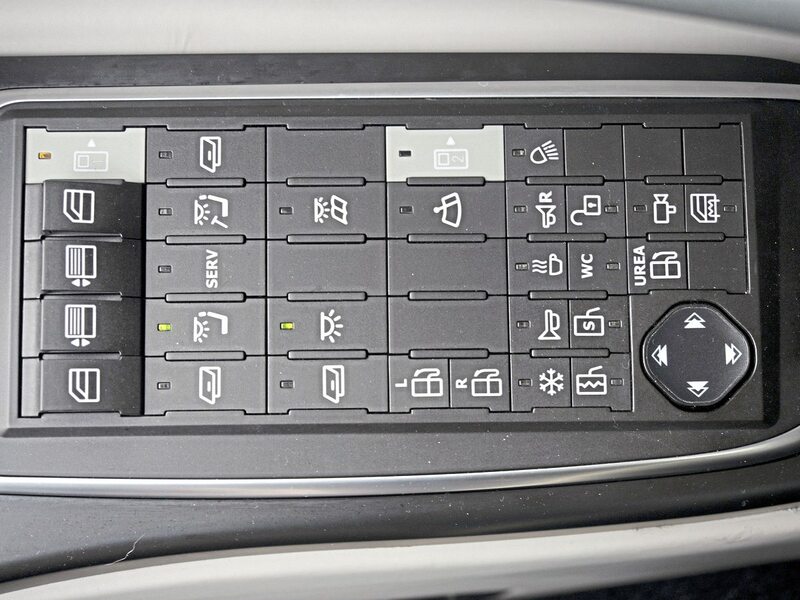 To the right of the driver there is a cluster for all the main saloon controls, including a four-way rocker switch for mirror adjustment. Our driver didn’t take instantly to this control, as it cycles through the three mirrors (the left and right upper mirrors and a third mounted on the waist rail) in a colour sequence which had to be learned. That said, the controls and the mirrors were extremely adjustable and gave excellent rear vision. 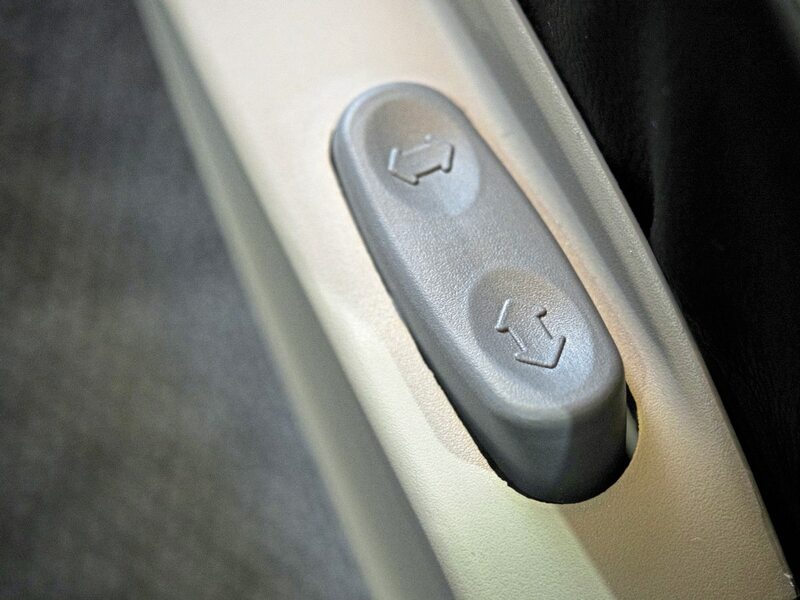 Also on this panel were the two door release switches, each highlighted in grey for easy location. As with all the switches, they have LED lights to show their operating state. The speedometer and tachometer are separated by a status screen for engine and gearbox. 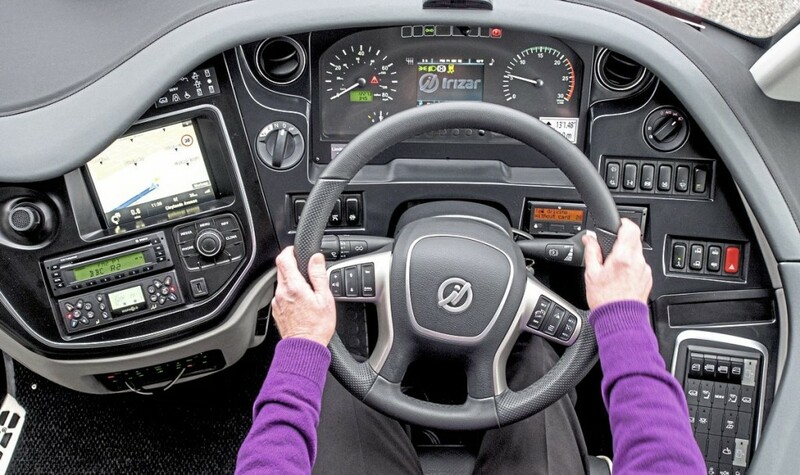 To the left and right are ventilation apertures and further left, a cluster of warning lights above the HMI (Human Machine Interface) screen which gives access to cameras, sat nav, media, phone and climate controls. 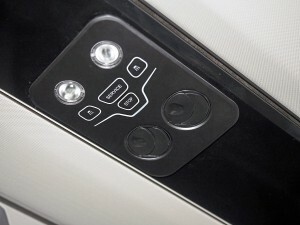 These are navigated with a joystick control below, surrounded by fast-access buttons to each of the systems. 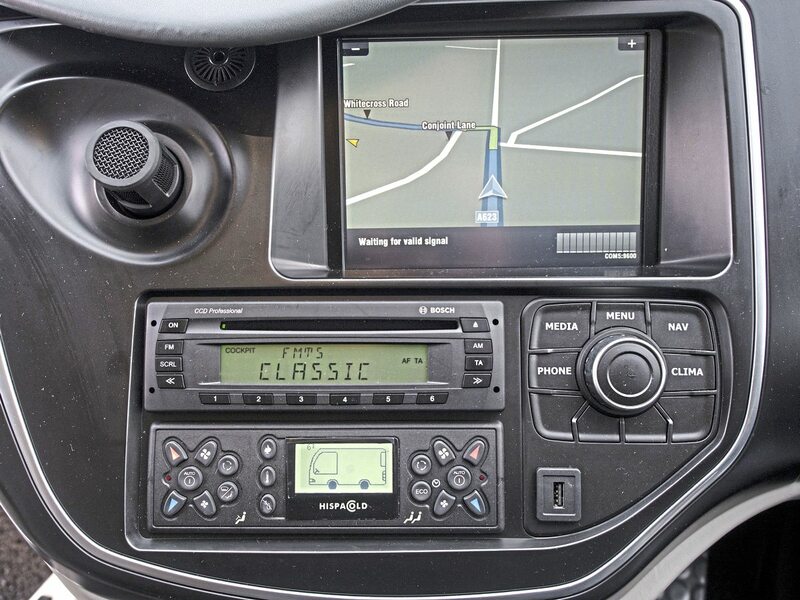 Further left is the Bosch Professional Line 3 media head unit with HDMI input and DVD slot. The tachograph is sited below. The suspended driving seat is from Isringhausen, and will be familiar to most drivers. 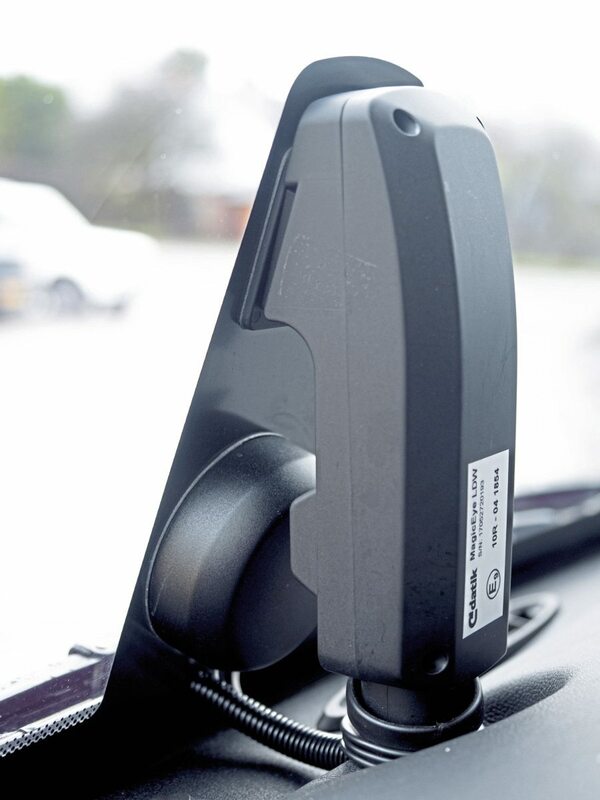 It has a driver microphone attached by a flexible stem while there is a maplight attached to the coach in the same area, again on a flexible stem. The seat is surrounded by lidded storage pockets though only the courier area in the stepwell has a document store suitable for A4 paperwork. The courier has a flip-up seat and hand-held microphone, and there is a third microphone centrally located in its own pocket. As with all new vehicle deliveries at Irizar UK, our driver was given a familiarity tour, and noted afterwards that the i8 is definitely a vehicle you would have to ‘learn’ over time. It will be in the nature of most customers for the i8 that it will tend to have a dedicated driver, so this is not a major problem, but with the demand for ever more – and ever better – accessories and climate control systems, media and for driver information, more switchgear is inevitable. 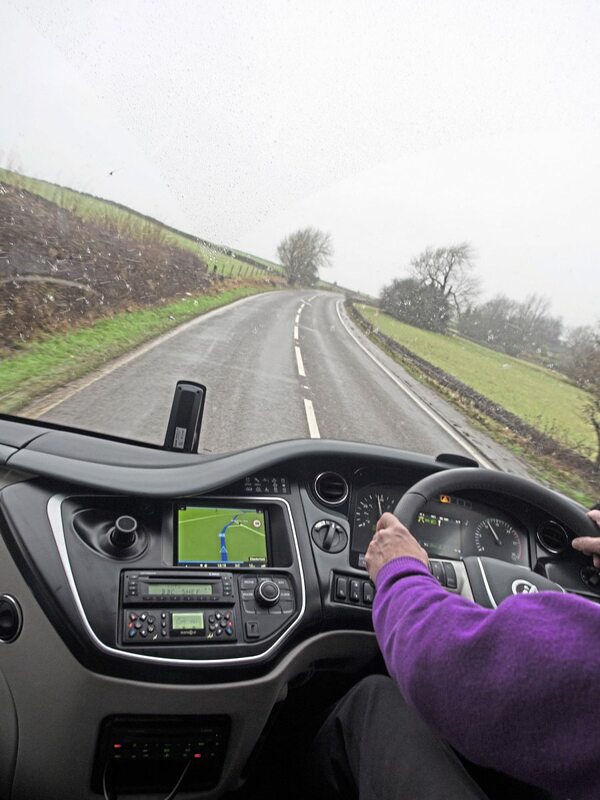 Our driver immediately noted that he had excellent all-round vision in the i8, the mirrors perfect for reversing maneouvres in conjunction with the rear-view camera, the screen and side windows kept clear of condensation on the cold, damp day and offering even a reasonable view of the nearside from the driving position. 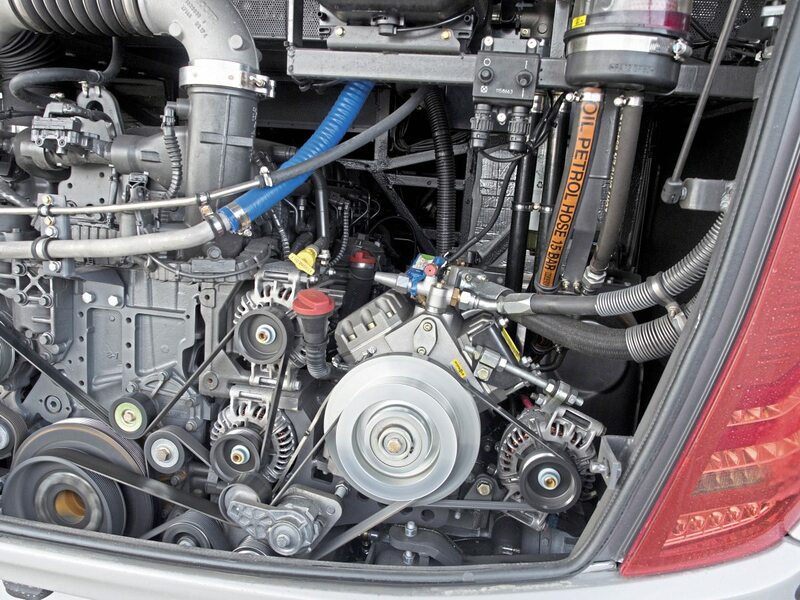 He’s driven coaches with AS-Tronic gearboxes in their early days, when dwell between gears was an issue, but noted that recent incarnations of ZF’s popular, 12-speed auto-shift gearbox are super-smooth with dwell only apparent between very low gears, and even then, not noticeable. Likewise the gearbox’s intarder, which proved progressive and powerful, massively reducing need for the service brakes. The braking system also comes, as standard, with AEBS – automatic emergency braking which scans the road ahead and applies the brakes if the driver does not respond to warning of a possible collision. We had no opportunity to test this system. Like AEBS, Lane Departure Warning is now mandatory on new coaches. On the i8, crossing any white-painted line without using the indicator triggers a seat vibration and visual warning, and our driver said he’s grown to like the extra nudge this can provide. Acceleration in the i8 – the road test vehicle having the 510bhp MX13 engine – was brisk in all situations, whether to reach traffic speed from a standing start or in overtaking maneouvres up the legal maximum, at which speed the engine was sitting at a comfortable 1,200rpm. We had to make a number of reversing maneouvres during the test, one requiring precise control to back into a narrow single-lane road. Our driver praised the i8’s rear-steer control, which made this surprisingly easy: “It just doesn’t feel like such a big coach,” he said. Outswing was easily judged, he said. The driver singled out the service brakes for special praise. He said they were powerful but always progressive and could be applied without any jolting. In particular, they offered infinite control when idling downhill. The i8 is fitted with ‘hill hold’ as standard, though it can be deactivated by the driver. In the test, our driver said it also operated when expected and without any lag when the throttle was applied. Only a couple of minor niggles were voiced. The position of the handbrake, behind the driver on the right, he felt was a little too far back and, although he generally loved the dashboard, the view of the speedometer and tachometer was partially obscured by the top of the steering wheel. He tried adjusting the steering wheel height but failed to completely resolve this issue. That said, the driver isn’t very tall, and this may be less of an issue for another driver. He also said that the i8 is by no means unique in this, and that it is something a regular driver would learn to live with. On this relatively short, 76-mile test route it would have been difficult to get a completely accurate test of fuel economy, but during testing for the International Coach of the Year Award, figures of between 11mpg and 12mpg were achieved, giving huge range for its 670-litre fuel tank. That said, at this end of the market, fuel economy is not a major consideration. Bosch Professional Line 3 system and DVD l Two monitors l Rack lockers l Reversing camera l Centre stairs camera l Road camera l Integrated Bosch microphone in driver’s seat l Extra Bosch microphone for guide in B Pillar l Black-tinted side windows l Third windscreen wiper l Anti-syphon device l Two cant rail loading lights l Third alternator l Durabright alloy wheels l Desk in fridge cover l Electric hand dryer in WC l Reading light for driver and guide. The noise results quoted are incredible; but unfortunately I mean that in a very literal sense. Below 50dB is not achievable by moving vehicles today. The quietest cars in the world are all louder than 55dB when on smooth motorway at 80km/h (exception is Mercedes S Class which has always been the best road vehicle for cabin noise and latest 2016 version achieves a phenomenal 54dB). 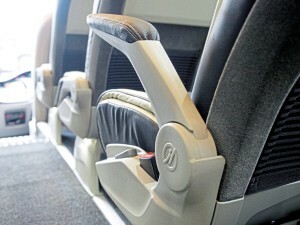 Passenger cards only get under 50dB when they are not moving and engines are off as a result of start-stop technology. I very much agree that Irizar i8 is among the leaders for cabin noise level+build quality+comfort, but numbers of 42 and 43dB are not correct; I suggest that the sound level meter setup be checked or that the microphone needs to be calibrated. I confess that the meter has not been calibrated and was assumed accurate. I see from other more sophisticated testing that measurement in sone would be more relevant. Rather scuppers my intro! You are right, the meter has not been calibrated, and it is possible, if not probable, that this reading is too low. My apologies. No apologies required, inaccurate readings happen all the more frequently Mark due to more widespread availability of meters and sound level apps on mobile phones (not great microphones!) However, if ever you do want some further insight into making professional noise assessments, myself or an acoustic engineer colleague from Ventac vehicle noise control would be happy to help you with the noise meter set up and take you through best practice tips for making accurate noise measurements. We can also show you a procedure for conducting expert subjective assessments of vehicles. Keep up the test drive review articles! We believe it would be gratifying to test and sound calibrated in BRAZIL where we would make a journey using this wonderful Bus in a campaign by several Brazilian states in Public Health campaign and at the same time governments and the population to benefit. Anyway congratulations a beautiful dream of buses and concept.